Gerfen, Katie. ‘Beaver Country Day School Research + Design Center’. ARCHITECT Magazine. March, 2019. 90-99. Print and Web. Katz, Marni Elyse. ‘Double Vision’. Globe Magazine, The Boston Globe. February 2019. Stephens, Suzanne. ‘Dissonant Dialogue’ or ‘Daniels Building by NADAAA’. Architectural Record. November 2018. ‘Der Weg ist das Ziel – die Tanderrum Bridge in Melbourne’ or ‘The Path to Perfection – Tanderrum Bridge in Melbourne’ Structure: published by Detail. Fall 2018. 3-5. Fabris, Luca Maria Francesco. ‘Tanderrum Bridge: Stainless Steel Filigree’. The Plan. Issue 107, Summer 2018. 80-84. Minutillo, Josephine. ‘The Future of Practice: Medium Firms’. Architectural Record. June 2018. 122-124. ‘Dos Historias’. Arquine. May 18, 2018. O’Brien, Darragh. ‘MSD Four Years On’. Evidence Based Design Journal. May 2018. Fig Projects. ‘Minimal appeal’. Interwoven. April, 2018. ‘NADAAA + Cooper Union students build linear pavilion in one of Shenzhen’s urban villages’. Designboom. March 18, 2018. Després, Delphine. ‘Interconnexion’. ARTRAVEL. #80. 2018. Bernstein, Fred. ‘For Nader Tehrani, Architecture Is a Universal Language’. Architectural Digest. February 9, 2018. Celiento. Ilia. ‘PEDAGOGY BROUGHT TO LIFE’. PLATFORM. February 2018:62-65. Gee, Marcus. ‘The school of Hard Knox’. The Globe and mail. January 2018: A6. Greenberg, Ken. “Turning Full Circle’. CANADIAN ARCHITECT. November 2017. Osborne, Catherine. “How NADAAA saved One Spadina’s Amazing Ceiling”. AZURE. November 2017. ‘Rock Creek House’. ARKETIPO. October 2017:50-61. Carlson, Wendy. ‘THE FUTURIST’. HOTCHKISS MAGAZINE, The Art of Design. Fall Issue: 20-23. ‘Mantra Restaurant, Boston, Massachusetts-US’. ΔΟΜΕΣ. Sep/Nov 2017: 66-75. ‘Nader Tehrani’. BLUEPRINT 354. September/October, 2017. Sealy, Peter. ‘Designers’ home in Toronto’. Abitare. September 28, 2017. Kroloff, Reed. ’A Generation of Architects Making Its Mark at Dizzying Speed’. New York Times. September 8, 2017. Davidge, Tania. ‘ Tanderrum Bridge by John Wardle Architects and NADAAA’. Architectural Record. August 2017. Solondz, Simone. ’Justice through Better Design for Inmates’. August 29, 2017. Obermoser, Edina. ’Old walls in new splendor: Rock Creek House by NADAAA’. Detail. August 28, 2017. Buonopane, Paul. ‘The 15 Best Architects in Boston’. August 16, 2017. Bernstein, Fred. ‘Nader Tehrani Is Literally Shaping the Future of Architecture.’ Architectural Digest. July 20, 2017. Budds, Diana. ‘Redesigning New York’s Most Notorious Jail’. Fast Company. July 17, 2017. Fixsen, Anna. ‘New Report from Van Alen Institute Proposes Design Alternatives to Rikers Island’. Architectural Record. July 13, 2017. Blander, Akiva. ‘From Jails to “Justice Hubs”: New Report Details How Design Can Improve & Integrate Jails in Our Cities’. Metropolis. July 13, 2017. Lynch, Patrick. ‘Four Projects Shortlisted for 2017 Moriyama RAIC International Prize’. Archdaily. May 25, 2017. Bozikovic, Alex. ‘Merging the past with the future’. The Globe and Mail. May 5, 2017. Messner, Matthew. ‘NADAAA designs a shimmering tower for downtown Cleveland’. The Architect’s Newspaper. April 27, 2017. Lynch, Patrick. ‘NADAAA, Gluckman-Tang, LTL Selected as Finalists in Competition for Telluride Arts Center in Colorado’. Archdaily. April 4, 2017. ‘Rock Creek House’. Divisare. April 5, 2017. Lewis, Tomos. ‘Apogee architecture’. Section D. Monocle. Episode 286. April 4, 2017. Trujillo, John. ‘NADAAA overhauls brick Virginia house with ample glazing and a plywood interior’. Dezeen. March 15, 2017. Angeli, Brunella. ‘Reinterpreting Tradition’. The PLAN Magazine. March 2017: 108-118. Risen, Clark, ‘64th Progressive Architecture Awards: Honorable Mention, New Hampshire Retreat’. Architect, Feb 2017. Walsh, Niall Patrick. ‘Humanity and Art Entwined – How NADAAA’s Exhibit Became Blankets for Syrian Refugees’. Archdaily. February 10, 2017. Mackenzie, Andrew. ‘Spanning the gap between park and precinct: Tanderrum Bridge’. Foreground. January 30, 2017. Cheng, Linda. ‘John Wardle Architects, NADAAA-designed Tanderrum Bridge opens’. Architecture AU. January 20, 2017. Volner, Ian. ‘Rock Creek House’’. Architect Magazine. January 2017: 123-130. Berman, Ila and Burnham, Douglas. ‘Expanded Field’. New York: Berman+Burnham. 2016: 104-109, 160-167. Nader Tehrani interviewed by Wes Hiatt. ‘The Author and the Discipline: A Conversation with Nader Tehrani’. Paprika!. Issue 02-09. December 1, 2016. Katz, Marni Elyse. ‘The Longest Loft’. Boston Home. Winter 2017: 60-64. Keegan, Edward. ‘Rock Creek House’. Custom Home. Fall 2016: 34-35. ‘School of Design, University of Melbourne’. Arketipo. No 105. September 2016: 66. Print. Saraiva, Céline. ‘Une scéne pour penser demain’. Architectures Cree. No 378. Oct-Nov 2016: 104-109. Print. Zabeti, Milad. ‘Spaces of Pedagogy’. Memar Magazine. October 2016: 38-41. ‘Meet the Deans: Nader Tehrani’. The Cooper Union. September 2016. Louie, Elaine. ‘Material Connection’. Dwell. September 2016: 82-89. Hopkins, Stephen. “Nader Tehrani”. Persons of Interest. July 2016. 1-11. Stevens, Philip. ‘NADAAA reconsiders the tensile vault with interlocking ‘catenary compression’. designboom. April 2016. ‘Catenary Comments’. Wentworth Architecture Review. Volume 6. March 2016. ‘Melbourne School of Design, The University of Melbourne’. Architecture Australia. Nov/Dec 2015. Dickinson, Elizabeth Evitts .’The 2015 Architect 50: The Top 50 in Design’. Architect Magazine. September 10, 2015. Bernstein, F. ‘Nader Tehrani’. ARCHITECTURAL RECORD. August 2015. 24. Meyer, Insa. ‘VOM GEBAUDE LERNEN’, md Magazine, March 2015. 60-66. Kvan,Tom. Hutson, Andrew. ‘ENHANCED LEARNING’. INDESIGN. Issue 60.131-134. Conrad-Bercah, Paolo.’Melbourne School of Design, Melbourne, Australia, John Wardle Architects and NADAAA’, THE PLAN. March 2015. 96-108. Kaji-O’Grady, Sandra. 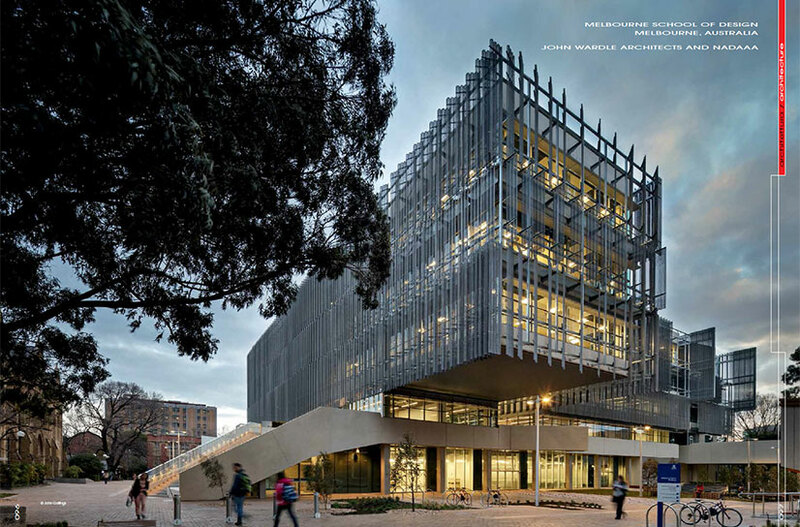 “Melbourne School of Design”, Architecture Australia, Jan/Feb 2015: 22-32. Russell J., Cassell W. “ARCHITECTURE & PEDAGOGY, John Wardle and Stefan Mee + Nader Tehrani”. INFLECTION, Nov.2014: 76-87. Khabazi, Zubin. Digital Design Progresses. Mashad: Kasra Publishing, 2014. 78-89. Print. Volner, Ian. “Faculty of Architecture, Building and Planning”. Architect, November 2014: 92-103. Wills, E. and Elizabeth Evitts Dickinson. The Architect Top 50, Architect Magazine. Sep 2014, 70-82. Beorkrem, Christopher. Material Strategies in Digital Fabrication, Routledge, 2013, Print. Bercah, Conrad. “Model Home Gallery”, The Plan: Architecture & Technologies in Detail, Issue 070, 54-60. Nader Tehrani Interview with suckerPUNCH, “Interview with Nader Tehrani”, Fresh Punches Experimental Architecture Exhibition of Student Work, June 2013, pp. 291-296. John de Manincor and Sandra Kaji- O’Grady, “Making, Matter and Meaning”, Architecture Australia, May/June 2013, pp. 19-22. Yoonhyung Lee, “Model Home Gallery”, DETAILS 32 Special Issue, Spring 2013, pp. 22-33. Raskin, Laura and Syrkett, Asad, “The Architecture of Architecture Schools: Hinman Research Building”, Architectural Record, November 2012, p. 77. Shiny Lu, “Fleet Library at The Rhode Island School of Design”, The Art of Libraries: Constructing Reading Paradise, October 2012, pp. 282-295. Lee, Kyunghoon, “Critique: Raemian Gallery, Memories of Temporary Architectures”, SPACE, No. 539, October 2012, pp. 46-51. “People/ Interview: Creative”, Interni & Décor, September 2012, No. 160, pp. 224-229. Nader Tehrani interview with Kurt Evans, Iben Falconer, and Ian Mills, “The Agency Interview: Three Schools of Architecture,” Perspecta 45, Fall 2012, pp. 17-26. K. Michael Hays,”‘Figure, Phenomenality, and Materiality in the Hinman Studio,” Harvard Design Magazine 35, Fall 2012, pp. 46-53. ‘Interview 4: Nader Tehrani, Michael Meredith,’ MATTER: Material Processes in Architectural Production, Eds. Gail Peter Borden and Michael Meredith, Routledge, 2012, pp. 35-42. ‘Unraveling Methods of Design and Construction: An Interview with Nader Tehrani,’ with Kevin Eckert and Andrew van Leeuwen (Build, LLC), ARCADE, Summer 2012. Michael Hensel and Mehran Gharlegi, ‘Practices Abroad: Today’s Diaspora, Tomorrow’s Architecture,’ AD ( Iran: Past, Present and Future), May/June 2012, pp. 102-119. Kelsey Keith, ‘Façade Focus: Wood,” DWELL, May 2012, p. 98. Matt Alderton, ‘Virtual Realities,’ Green Building & Design, April/May/June 2012, pp. 84-97. Lorenzo Salvia, ‘Universidadi,’ STYLE Magazine, January/February, 2012, pp. 110-117. ‘2011 Annual Design Review: Hinman Research Building,’ Architect, December 2011. ‘Ciudades Inteligentes en Perspectiva,’ La Vanguardia, November 10, 2011. Kim A. O’Connell, ‘Architecture Aloft,’ Eco-Structure, Nov/Dec 2011, pp. 54-59. Alan G. Brake, ‘Creating Suspense,’ AZURE, Nov/Dec 2011, p. 19, pp. 50-53. Belinda Yanks, ‘An Exhibition Celebrates 50 Years of Cocktail Culture, ‘ Co. Design, July 2011. Conrad Bercah, ‘Office dA: Nader Tehrani in USA,’ The Plan, Issue 051, pp. 28-42. Vernon Mays, ‘Hinman Research Building Rehabilitation and Adaptive Use,’ Architect, June 2011, pp. 94-102. Bill Van Siclen, ‘In the Galleries: ‘Collision’ at the RISD Museum celebrates the ephemeral and experimental,” Providence Journal (projo.com), January 20, 2011. Catherine Fox, ‘At Georgia Tech: Brad Cloepfil Talk, a New Appointment and the Fabulous Hinman Rehab,’ ArtsCriticATL.com, January 17, 2011. Daniel Jost, ‘Save Us from Ourselves,’ Landscape Architecture Magazine, January 2011, pp. 118-127. Eds. Stan Allen and Marc McQuade, ‘Villa Moda: Office dA,’ Landform Building, Lars Muller Publishing/ Princeton University School of Architecture, 2011, pp. 380-391. Chris van Uffelen, ‘Arco Station,’ Automobile Architecture, Braun, 2011, pp. 182-185. Philip Jodido, ‘Helios House,’ Architecture + Automobiles, Images Publishing Group, 2011, pp. 98-105. Eds. Markus Sebastian Braun and Michelle Gallindo, Atlas of World Interior Design, Braun Publishing AG, 2011, p. 480. Antoine Picon, Digital Culture in Architecture, Birkhauser Basel, 2010, p. 181. Manuela Roth. Library Architecture + Design (Masterpieces), Braun Publishing AG, 2010. pp. 194-197. Thomas Chung and Weijen Wang, Refabricating City: A Reflection, Hong Kong-Shenzen Bi-City Biennale of Urbanism/Architecture, Oxford University Press: China, 2010, p. 199. Carol Terry “The Making of the 21st-Century Art Library: Cultivating Vision, Collaboration and Support,” The Handbook of Art and Design Librarianship, Facet Publishing: London [Eds.Amanda Gluibizzi and Paul Glassman], 2010, pp. 295-303. Joachim Stumpp and Hannes Baurle, individualdesign, Deutsche Verlags-Anstalt/ Verlagsgruppe Random House, 2010, pp. 92-93. Global Style: Interiors and Colors, Dopress Books: Shenyang, China, 2010, A-pp. 208-215; B-pp. 130-135. Dimitris Kottas, Contemporary Digital Architecture: Design and Techniques, LinksBooks: Barcelona, 2010. Gail Peter Borden, Material Precedent: The Typology of Modern Tectonics, John Wiley and Sons, Inc.: Hoboken, NJ, pp. 30-31, 149-153. Graeme Brooker and Sally Stone, What is Interior Design? Rotovision SA: Switzerland/UK, pp. 106-107. 125-127. ‘Banq,’ First Floor, Issue 12, 2010, cover, p. 3. Mairi Beautyman, “Symphony in Wood,” Interior Design, pp. 87-90, July 2010. “Where Practice Meets Pedagogy,” Indian Architect & Builder, May 2010, pp. 96-101. Office dA Installations, ‘A+U’, May 2010, pp. 22-23. Paul Goldberger, “Shadow Building,” The New Yorker, May 17, 2010. Javier Arpa, Aurora Fernandez Per, NEXT: Collective Housing in Progress, Density Series, a + t ediciones, 2010, pp. 106-117. Thomas Chung, Weijen Wang, Refabricating City: A Reflection, Oxford University Press, 2010, p. 199. Architecture Zone: A to Z 2, H.K. Rihan Int’l Culture Spread Limited, 2010, pp. 92-95. Marc Kristal, Re-Crafted, The Monacelli Press, 2010. Toby Horrocks, “Bridging Disciplines,” DQ (Design Quarterly-Australia), Spring 2010, pp. 83-86. Osman Attman, Green Architecture: Advanced Technologies and Materials, McGraw Hill, 2010, pp. 191-192. Luis Fernandez-Galiano (Ed. ), Atlas. Architectures of the 21st Century. Asia and the Pacific, Fundacion BBVA, Bilbao, Spain, 2010, p. 86. “Architecture X File: 100 Ideas,” H.K. Rihan Int’l Culture Spread Limited, 2010, pp. 26-27. Sharestan, Special Issue: Office dA, Autumn/Winter 2009-2010, pp. 1-125. Lisa Iwamoto, Digital Fabrications, Princeton Architectural Press, 2009. X Space, Sandu Publishing Co., Limited, Beijing, China, 2009, p. 184-187. “Paysage Boise,” AMC Le Moniteur, December 2009, pp. 174-175. “Banq,” a+u, December 2009, pp. 222-223. William R. Morrish, Susanne Schindler, Katie Swenson, Growing Urban Habitats, William Stout Publishers, San Francisco, 2009. Mardolei Prin, “Arquitectos proponen diseños ecológicos,” El Nacional, October 25, 2009, p. 6 suplemento espacios. Catherine Osborne, “Office dA’s School of Architecture,” Azure.com, October 8, 2009. Scott Elliott, “Campus connection breathes life into design,” The Australian Financial Review, October 16-18 2009, p. 13. David Scott, Katherine Smith, “Building Character,” Voice: University of Melbourne, October 12- Nov9, 2009, 1, 4. Amber Bravo, “The New American Home,” Dwell, October 2009, pp. 70-71. Aurora Fernandez Per, Javier Mozas, Javier Arpa, HoCo: Density Housing Construction and Costs, a+t ediciones, 2009, 402-417. Luisa Pianzola, “Una Grotta Contemporanea,” Progettare, September 2009, pp. 44-49. Philip Jodido, Green Architecture Now! Taschen, 2009, pp. 252-267. Jianfei Zhu, Architecture in Modern China, Routledge Taylor & Francis Group, New York, 2009, pp. 177, 183-5, 205. “Ciudad Saemangeum,” Future Arquitecturas, Issue 16/17, 2009, pp. 2-17. “Ribbed Illusion,” Architecture Plus, Vol. 21, 2009, pp. 92-95. David Sokol, “Waves of Grain,” Inside, Issue 56, 2009, pp. 64-69. Jason Young, ed., Middle_Out, Taubman College of Architecture + Urban Planning University of Michigan, 2009. “Banq,” SPA-DE, Vol. 11, pp. 36-41. “Ordos & Hilton,” di Architecture & Design, pp. 137-141. Imdat As and Daniel Schodek, Dynamic Digital Representations in Architecture: Visions in Motion, Taylor & Francis Group, London and New York, 2008, p. 81. Kwang-young Jeong, 2008 Architecture Annual, Archiworld Co., Ltd., Seoul Korea, 2008, pp. 146-153. Mark McMenamin, “Best of Year: Formal Dining,” Interior Design, December 2008, pp. 78-79. Bruce Q. Lan, Arch-Manual: Design + Concept + Script + Process, AADCU Publication, 2008. Editors of Phaidon Press, The Phaidon Atlas of 21st Century World Architecture, Phaidon Press Limited, London, 2008, p. 105, 637. “Saemangeum Development: Immature Attempts in the Land of Desire,” Space, December 2008, pp. 50-87. KJ Fields, “Against the Status Quo,” Eco Structure, November/December, 2008, pp. 42-48. Nader Tehrani interview with the editors, ‘On Making: Volume 5,’ Summer Institute for Architecture Journal, School of Architecture and Planning, the Catholic University of America, 2008, pp. 102-109. “Banq,” Details, Vol. 10, 2008, pp. 154-163. Robert Levit, “Contemporary ‘Ornament’: The Return of the Symbolic Repressed,” Harvard Design Magazine, Spring/Summer 2008, pp. 70-85. Clifford Pearson, “American Architecture Today: Six Critics Examine the State of American Architecture from their Hometowns,” Architectural Record, February, 2008, pp.87-93. Chris Grimley and Mimi Love, Color Space Style, Rockport Publishers, Inc., 2007, p. 147. “Design Bordering on Art,” Monitor, No. 46, 2007, pp. 64-67. Won Jung Yeon, Moon Geun Yi, “Office dA,” Bob, No. 040, 2007, pp. 18-57. Carol Terry, “From Grand Banking Hall to the Art and Design School Library of the 21st Century,” Art Libraries Journal, Vol. 32, No. 4, 2007, pp. 11-17. Tim McKeough, “Talent Pool: Making Their Mark from New York to Tokyo,” Fast Company, October 2007, p. 119. Alison Beard. “From Silverware to City Districts,” Financial Times, May 19/20 2007. Hansy Better Barraza. “The Urban Window,” Residential Architect, January/February 2007, pp. 37-38. Russell Fortmeyer.’Dressing Up Fashion,Dressing Down Architecture: Exhibitions’,Architectural Record, Jan 2007, 47-49. Elaine Louie. “A House Built Around a Tower of Books,” The New York Times, January 18, 2007, p. D6. Douglas Cooper. Drawing & Perceiving, John Wiley & Sons, Inc. USA, 4th ed., 2007, pp. 88-89. Kyna Leski, The Making of Design Principles, R.E. Smith Printing Co., Inc, Fall River, MA, 2007. “Skin + Bones: Parallel Practices in Fashion and Architecture,” Canadian Architect, September 22, 2006. Elaine Louie. “From Architecture Students, A Sculptural Structure of Polycarbonate,”The New York Times, Sep 2006, F3. Nader Tehrani, “Interview: A Conversation with Nader Tehrani, Office dA”, Practices 7/8, Spring 2006, pp. 111-121. Fred Bernstein. “Record Houses,” Architectural Record, April, 2006, p. 114-121. 10x10_2: 100 Architects, Ten Critics, Phaidon Press Inc., 2005. Rodolphe el-Koury. “The Digital Craft of Office dA,” 32BNY, Issue 5/6, Winter 2005, pp. 44-45. Emerging Architecture: Commended, Spiritual Centre, ar+d, December 2004, p. 68. C.C. Sullivan. “Pushing Boundaries,” Architecture 93:4, April 2004, pp. 55-63. Kristi Cameron and Paul Makovsky. “When Did Craft become a Dirty Word?” Metropolis, October 2003, p. 116. Barbara Knecht. “Radiating Creature Comforts in Buildings,” Architectural Record, September 2003, pp. 165-166. Thomas Mellins. “The Gap Between the Promise and the Prototype,” Architectural Record, July 2003, 74-80. Greg Lynn, Intricacy, Institute of Contemporary Art, Philadelphia, 2003. Anna Cousins. “Tehrani’s World of Sensibility,” Views: Rhode Island School of Design, Summer 2002, p. 28. Brian Carter and Annette Lecuyer. All American: Innovation in American Architecture, Thames & Hudson, New York, 2002, 92-99. Toshiko Mori. Ed., Immaterial | Ultramaterial: Architecture, Design and Materials, George Braziller, New York, 2002, 1-7. Sophia A. Gruzdys. “Drawing: The Creative Link,” Architectural Record, January 2002, pp. 65-67. Raul A. Barreneche. “49th Annual P/A Awards,” Architecture Magazine, January 2002, pp. 55-75. Edward Wyatt. “Everyone Weighs in with Rebuilding Ideas,” The New York Times, January 12, 2002, p. B3. Marcus Springer. “Musing on a Tactile Illusion – The Architecture of office dA,” Il Progetto, July 2001, pp. 56-63. Rodolphe el-Khoury. “Office dA’s House Dressing,” Thresholds, Fashion Issue 22, 2001, pp. 49-54. Sara Hart. “Weird Science in a New Age of Industry,” Architecture Record, April 2001, Living Arts, pp. 163-168. David Dillon.“Material evidence; Harvard Exhibit Peeks at the Future of Homebuilding,”The Dallas Morning News, Mar 2001, 5C. Carol Vogel. “The Envelope, Please,” The New York Times, January 5, 2001, p. B38. Stephen Armstrong. “Mass. Education,” Wallpaper, October 2000, pp. 314-325. Jose Manuel Pozo Municio. “Teorai /Tecnica,” Disegnare, idee immagini, Anno VIII, No. 17, 2000, pp. 81-82. Jeannie Yoon. “Deceit /Fabrication,” Praxis: Detail, Issue One, Volume One, May 2000, pp. 4-19. Philip Nobel,Elana Frankel. “Environments: NEU Multi-faith Center” and “Furniture: Office dA Collection,” ID Magazine, Aug 2000, 145- 172. Rodolphe El Khoury & Oscar Riera Ojeda, eds. Office dA, Contemporary World Architects, Rockport Publishers, 2000. Jose Manuel Pozo Municio. “La Mirada, El Lugar y el Movimiento en el Espacio Grafico,” Revista de Expresion Grafica Arquitectonica, Numero Cinco, Pamplona, 1999, 79–87. Mark Pasnik. “Who’s Afraid of Architecture Theory?” Cornell Journal of Architecture 6, Distributed Art Publishers, 1999, 108–121. Philip Arcidi. “The Toledo House,” Architecture Magazine, April 1999, pp.68, 100-101. M. Saleh Uddin. “Office dA: Fabricating Coincidences,” Digital Architecture, McGraw Hill, 1999, pp. 4, 94-97. Joseph Giovannini. “A Luminous Interfaith Chapel Marks Office dA’s Debut,” Architecture Magazine, Sep 1998, 130-135. Herbert Muschamp. “In the Garden of Art, Structure Tempts,” The New York Times, March 6, 1998, p. B41. Terence Riley. “The Architect’s Room,” Fabrications. Museum of Modern Art, 1998, pp. 83-113. Reed Kroloff. “Zahedi House: On Corrugation and Corners,” Architecture Magazine, May 1998, pp.66-69. Jonathan Soloman. “Fabricated,” Spectacle: Columbia Daily Spectator Online.February 5, 1998. Ned Cramer. “Fabricated Follies,” Architecture Magazine. March 1998, pp. 44-45. Clifford Pearson, “Tackling the Really Big Ones,” Architectural Record, Vol. 02, 1998, pp. 119-121. Michael Sorkin. “Lite Construction,” Metropolis, July 1998, pp. 45-47. Jay Powell. “The New American House: Innovations in Residential Design and Construction,” Design Book Review 37/38, Winter 1996/1997, 24-25. Mitchell Schwarzer. “Tectonics of the Unforeseen,” Architecture New York (ANY No. 14), 1996, pp. 62-65. Deborah Dietsch. “Casa La Roca,” Architecture Magazine, May 1996, pp. 122-125. Oscar Riera Ojeda, Ed.The New American House. Whitney Library of Design, Watson-Guptill Publications, 1995. 188-195.